Giuseppe Bergomi was born in Milan and devoted his entire career to his beloved Internazionale. This central defender or right-back blossomed early and broke into the first team already during the 1980/81 season as a 17 year-old. He was soon acknowledged by national team coach Enzo Bearzot and was included in the 1982 World Cup squad having barely played 30 senior matches in the Italian league. Bergomi started the tournament on the bench, but came on as a substitute against Brazil in the memorable 3-2 second phase win. He did a great job and was included in the starting line-up against Poland in the semifinal because Gentile was suspended. 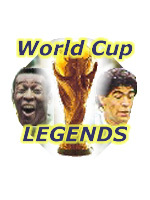 Everyone was impressed with how mature he played and Bearzot could not drop him for the final against West Germany. Bergomi was given the job of marking Rummenigge and completely took him out of the game. The German star was substituted in the second half as Italy ran out 3-1 winners. Giuseppe was a World Cup winner just over a year after making his first appearance in a senior match! At clublevel, Bergomi and Inter were in the shadow of AC Milan for much of the time. Having won an Italian Cup title in 1982, it took seven more years until another title was won. This time the Serie A, Bergomi’s only league championship title in his nineteen seasons at Inter. He experienced more success in European competitions winning the UEFA Cup on three occasions. 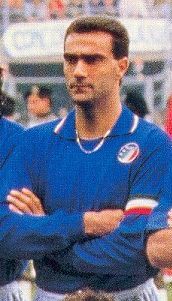 Italy hosted the World Cup in 1990 and Bergomi captained his country and played in every game as the Azzurri captured bronzemedals. A painful semifinal defeat on penalties to Argentina was all that stood betweem them and the final. Giuseppe didn’t figure frequently in the Italian line-up as the 1990s progressed. In a Euro 92 qualifying game against Norway, he came on from the bench only to be sent off seconds later for a bad foul! He wasn’t wearing the blue shirt of the Azzurri again until he, against all odds, was called up for the 1998 World Cup by Cesare Maldini. He made three appearences in his fourth World Cup, took one more domestic season with Inter, before retiring at the age of 36.